The metals and mining industry is inundated with various processes spanning operations on and off the field. Right from finding ore deposits to processing, as well as recruiting appropriate staffs for the production chain to ensuring their health and safety, technology plays the role of an enabler in this paradigm. A slew of emerging technologies—from advanced robotics, to energy management, remote monitoring and cloud applications are set to change the way miners operate in the following days. These technologies help companies to lower production costs, enhance worker and equipment productivity, discover new reserves and extend the life of current mines. In this scenario, narrowing down on solutions that best fit the specific needs of a miner is often a time consuming and complex task. A distinguished panel of prominent CEOs, CIOs, VCs, and analysts, along with CIOReview Magazine’s editorial board has assessed hundreds of vendors and shortlisted the ones that are at the forefront of providing cutting-edge technology solutions to the industry. The listing provides a look into how solutions in this domain are put into use, so that you can gain a comprehensive understanding of how they will optimize your business processes. 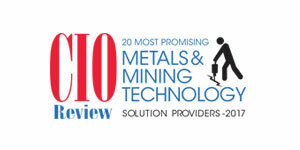 We present to you 20 Most Promising Metals and Mining Technology Solution Providers 2017.